Dapplegrey is a frontend for the macOS DOSBox port (which is available on the official DOSBox website) written in Xojo. In case you use already DBGL, or SVN build versions, these ports can also be used as DOSBox source to run games with. 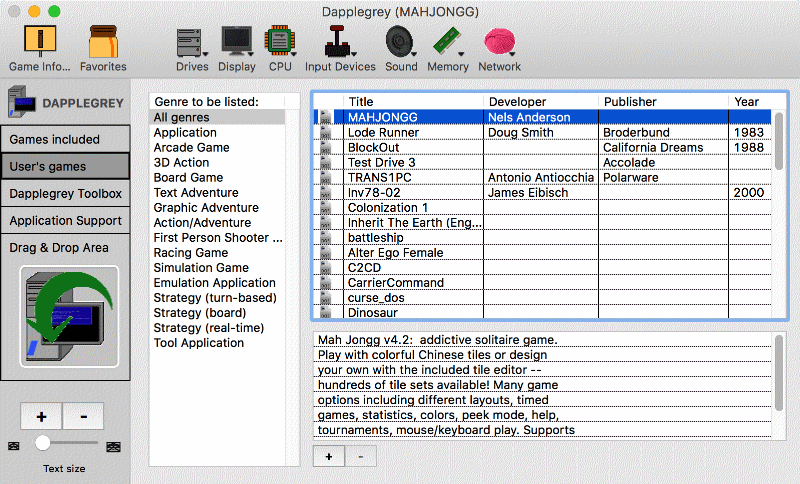 Dapplegrey enables you to set options provided by DOSBox, instead of editing the DOSBox config file manually for each game you want to run. The config file sent to DOSBox will be written to hard disk drive just before Dapplegrey tells DOSBox to start. 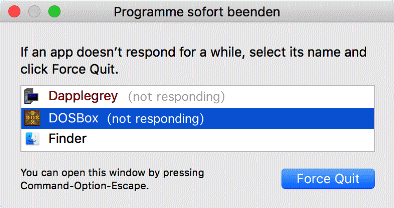 If both applications, DOSBox and Dapplegrey, does not respond for a while, go to the Apple Menu and call the window "Force Quit Applications". Dapplegrey will be re-animated automatically shortly after force quitting DOSBox. Dapplegrey may be mirrored at any download sites, with no permission required.